This year, I am taking on The Big Book of Christmas Mysteries, a 674 page tome containing 59 individual stories about the Christmas season. Conveniently, it’s broken up into blog-post sized sections. Shall we begin? I actually need to start with a general formatting note. I am not a huge fan of the way the biographies of the authors are presented. Each story is prefaced by a quick explanation of the standing or fame of the author, often including whatever work they are most famous for, and the source of the story. Honestly, I’d rather simply have the source of the story and save the plaudits for afterward or the footnotes. I started to skip or skim these pages after the third time that I felt disappointed by a bait-and-switch. For example, from the bio I see that such and such an author was famous for his comedies, but I discover upon reading that this piece is a drama. Or this one is known for this character, who stars in stories known for this style, but the story that follows has nothing to do with either of those things. I would like either more context about why this particular story is important or less context about other works of the author before reading, and in the absence of magic editing powers, I’ll keep skipping them unless I have a question. Okay, back on track, let’s run through the first group of stories. I’m sorry to say we don’t get off to a great start. 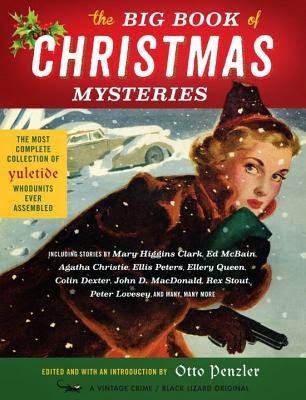 The Adventure of the Christmas Pudding, Agatha Christie - Cute, but unnecessarily convoluted. Gold, Frankincense and Murder, Catherine Aird - Fine, a bit dry. Boxing Unclever, Robert Barnard - Pleasant enough, the style is tangled. The Proof of the Pudding, Peter Lovesey - Dark and savage, very nice. The Adventure of the Dauphin’s Doll, Ellery Queen - Can’t say I think much of this. Morse's Greatest Mystery, Colin Dexter - Maybe this is better with context. As it is, far too saccharine. More than Flesh and Blood, Susan Moody - First one with any real style. Ending’s a bit flat. The Butler’s Christmas Eve, Mary Roberts Rinehart - I'm not sure why it ends so suddenly. Other than that I liked it, very evocative. The Trinity Cat, Ellis Peters - Best of the lot. The ones I liked the most in this section were: "The Proof of the Pudding", which is a dark story about a family where horrible abuse is going on, and how one person twists a Christmas tradition to save the innocents, and "The Trinity Cat", which is a lighter story about how a cat’s odd behavior leads to the solving of a murder-robbery. "More than Flesh and Blood" had nice style, although the Christmas connections were a little thin. It wasn’t much of a mystery, either, just a dark story about a man looking for the truth of his family and making a dark discovery. "The Butler’s Christmas Eve" was pretty decent, too, although I think the end is supposed to be a twist, and I’m not sure what I was supposed to get out of it. Despite some nice turns of phrase, I was the most disappointed with "The Adventure of the Dauphin’s Doll" and "Morse's Greatest Mystery", both stories starring the respective author’s most famous character. Both of these were dated in a tedious way and seem to require foreknowledge of the characters to get any enjoyment out of them. And from these samples, I am not in the least bit interested in knowing more about these characters. Similarly, "The Adventure of the Christmas Pudding" is a Hercule Poirot story, and it’s dull but not nearly so annoying.